The fulvous-breasted woodpecker (Dendrocopos macei) belongs to the family of piculets and woodpeckers, the Picidae. 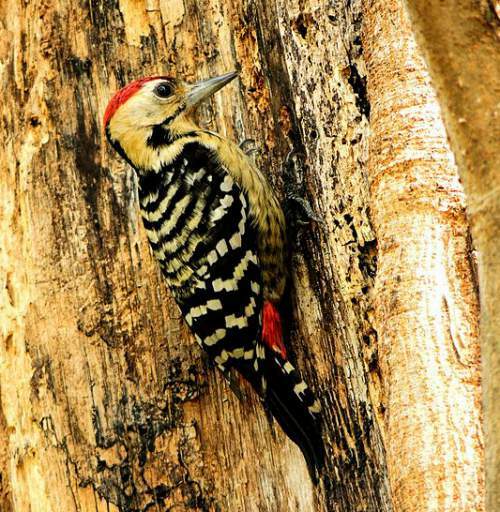 The fulvous-breasted woodpecker species is distributed in India, Nepal, Bhutan, Bangladesh, Pakistan and Myanmar. These woodpecker species nest and roost in holes excavated by them in tree trunks. These woodpeckers are polytypic species. The fulvous-breasted woodpecker (Dendrocopos macei) is a medium-sized woodpecker, measuring 17 to 20 cm in length and weighing about 25 to 40 gram. These fulvous-breasted woodpeckers have black upperparts with heavy white barring. The forehead, lores, face, ear-coverts and throat are fulvous or white. The black malar stripe extends down the sides of neck to meet black line from breast. 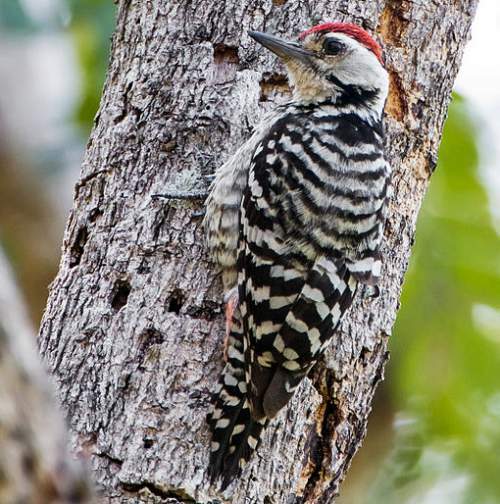 The woodpecker breast and upper belly are buff (fulvous). The belly is finely streaked. The lower belly, vent region and undertail coverts are reddish. The black uppertail has white bars and spots on the outer feathers. The flanks have light barring. The wings of the woodpecker are black with coverts and primaries having bold white barring. The black undertail has bold white barring. The males have red crown and the females have black crown. The juveniles have duller plumage. The bill of the fulvous-breasted woodpecker is slaty gray. The irises are dark brown. The feet are slaty gray or greenish gray. Their call is a sharp, loud "tchick or skik " sound. The fulvous-breasted woodpecker species is distributed in India, Nepal, Bhutan, Bangladesh, Pakistan and Myanmar. In India, these species are distributed in the states of Jammu and Kashmir, Himachal Pradesh, Punjab, Haryana, Uttarakhand, Uttar Pradesh, Bihar, Jharkhand, Chhattisgarh, Odisha, Andhra Pradesh, West Bengal, Sikkim, Assam, Meghalaya, Arunachal Pradesh, Nagaland, Manipur, Tripura and Mizoram. The fulvous-breasted woodpecker nominate subspecies D. m. macei is distributed in central and eastern Nepal, southern Bhutan, Bangladesh, northeast India, eastern peninsular India and north and western Myanmar. 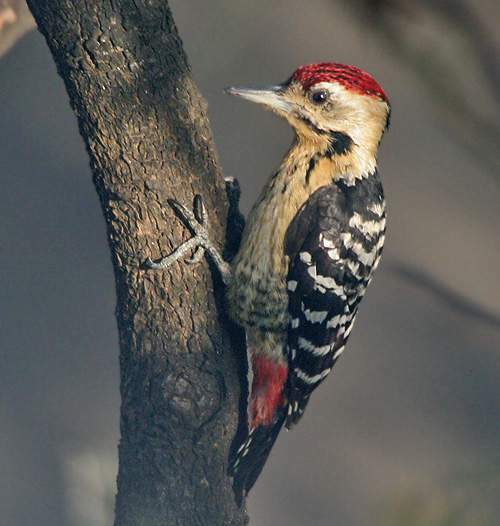 The fulvous-breasted woodpecker subspecies D. m. westermani is distributed in north Pakistan, northwest India (Jammu and Kashmir, Himachal Pradesh, Punjab, Haryana, Uttarakhand, Uttar Pradesh) and western Nepal. These fulvous-breasted woodpecker species have moderate forest dependence. They normally occur in altitudes from 0 to 2800 meters. The artificial ecosystems and habitats of these species include, plantations, farmlands with tall trees and rural gardens. The natural ecosystems and habitats of these fulvous-breasted woodpecker species include, tropical and subtropical moist lowland forests, open forests, montane forests, secondary forests, dry forests, dry grasslands and shrublands and inland wetlands. The diet of this fulvous-breasted woodpecker consists mainly of insects. Arboreal insects, insect larvae, grasshoppers, locust, cicadas, crickets, beetles, ants, termites, fruits, berries are their primary food. These woodpeckers are mostly arboreal and forage in mid-storey and canopy on tree trunks, branches and foliage. They have been observed to drop to ground for ants, termites and other prey. The breeding season of these fulvous-breasted woodpecker species is from January to May in most of their range. They make courtship display by raising crest, by swinging movements and by fluttering aerial display. The nesting sites of these woodpecker species are hollows in tree trunks and branches, excavated by the breeding pair. These species are monogamous and territorial. The clutch usually contains two to four white eggs. Both the parents incubate the eggs and care for the young. These fulvous-breasted woodpecker species are non-migrant resident birds. The populations living in the higher altitudes descent to lower levels during winter. The global population size of the fulvous-breasted woodpecker (Dendrocopos macei) has not been quantified. The overall population trend of the species is considered to be stable. In most of its range, this woodpecker species is reported to be rare to locally common. The generation length is 5.2 years. Its distribution size is about 2,630,000 sq.km. Habitat alteration and destruction, fragmentation of the habitats and trapping for pet-trade are the main threats that are endangering the survival of woodpecker species. The fulvous-breasted woodpecker (Dendrocopos macei) does not approached the thresholds for being Vulnerable either under the range size criterion, or under the population trend criterion, or under the population size criterion. The CITES (Convention on International Trade in Endangered Species of Wild Fauna and Flora) status is ‘Not Evaluated’ for fulvous-breasted woodpecker (Dendrocopos macei). The fulvous-breasted woodpecker (Dendrocopos macei) is closely related to freckle-breasted woodpecker (Dendrocopos analis) and stripe-breasted woodpecker (Dendrocopos atratus). The two recognized subspecies of the fulvous-breasted woodpecker are: Dendrocopos macei westermani (Blyth, 1870) and Dendrocopos macei macei (Vieillot, 1818). Current topic in Birds of India: Fulvous-breasted woodpecker - Dendrocopos macei.